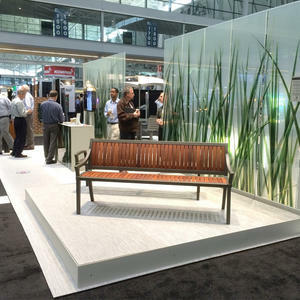 Thanks to everyone who stopped by our booth at last weekend’s ASLA Annual Meeting and Expo in Boston. 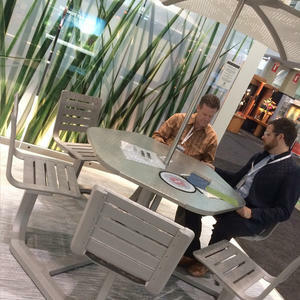 The show, which was the second most highly attended event in ASLA’s history, provided us with a great opportunity to meet with landscape architects and introduce them to our newest products and design tools. 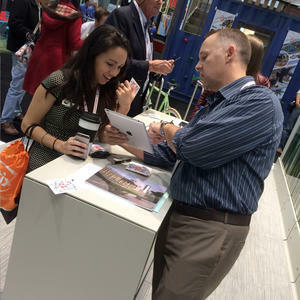 We were delighted to have unprecedented traffic to our booth this year. Many people stopped by when they saw the Frisbees we were giving away, but these weren’t ordinary Frisbees. 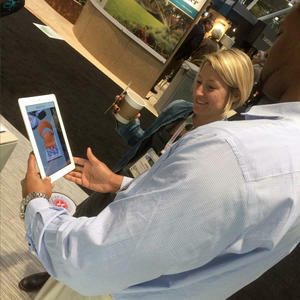 They were actually tracking markers for our new Augmented Reality App, an app that allows you to use your mobile device to visualize 3D models of some of our most popular products–wherever you’d like to see them. We gave away 500 Frisbees at the show, but if you didn’t get one, you can print out your tracking marker from our website and try the app for yourself. We truly enjoyed seeing people’s reactions to this ground-breaking product. 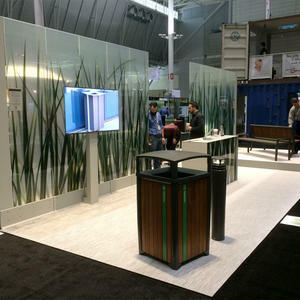 Our booth also drew lots of attention at the show, especially the 30-foot-long ViviGraphix glass feature wall which showcased one of our ZOOM Macro photographs – in this case, a close-up of sedge grass. The ZOOM Digital Darkroom, slated to launch in early 2014, is a remarkable online tool that lets users scale and crop ZOOM Macro and Panoramic images in limitless ways to create a personalized view from a single photograph. The site furniture was also a big hit. 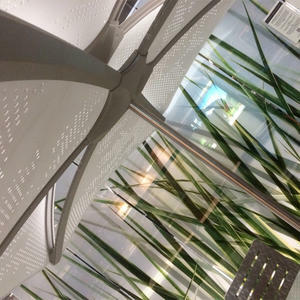 We featured our Tangent Table Ensemble (with the new Soleris Sunshade), our slim LED Tangent Bollard and our Summit Bike Rack. 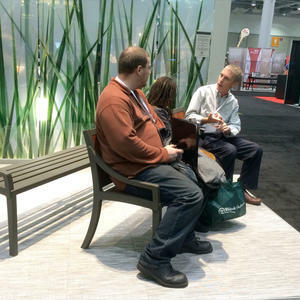 We also previewed our new family of Cordia products (including Cordia Bench, Cordia Bollard, and Cordia Receptacle) as well as the Rincon Bollard. F+S was honored once again to be recognized as a Hall of Fame Award Winner at the LAMMY Awards for our overall advertising performance over the year. 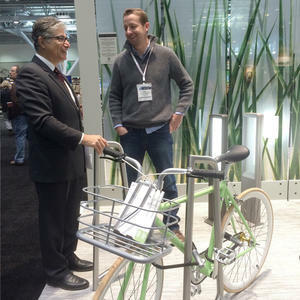 The award is given out by Landscape Architecture Magazine. 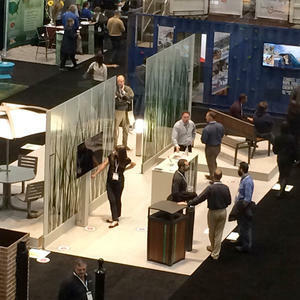 F+S Design Director Adam Tripp took part in a panel discussion during the ASLA Conference entitled, “Product Design and Its Relationship to Natural and Built Environments.” The lead designers from Landscape Forms and Maglin were also on the panel. The class was offered as part of a continuing education program to provide credits to Landscape Architects. Out of approximately 200 entrants, Danielle Desilets from Carol R Johnson Associates (CRJA) in Boston won the drawing for our custom Republic Bike. Congratulations, Danielle! Thanks again to everyone who participated in this event. 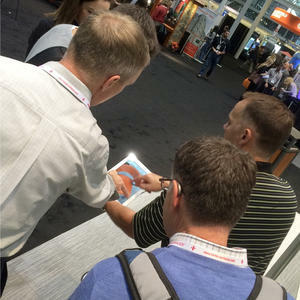 We enjoyed meeting with you and getting your feedback on our products. We’re looking forward to revealing more product innovations in 2014.